In the short time I have been reading and posting on this forum, I have noticed quite a few posts where people are sharing information and advice about growing spaces, from windowsill, to Edwardian cases, to sun rooms and all the way up to greenhouses. So I thought there might be some interest in a thread dedicated to growing spaces where people can post pics of their spaces, share info, ask questions. I find I learn something new every time I visit someone's growing space. This thread will allow us to visit each others' growing spaces in a "virtual" sort of way. I'll get the thread started. I live in Melbourne Australia where the climate is somewhat mild, similar in many respects to some places in the southern US. During our winter the temps are around 40F at night and 60F during the day. Winters are fairly cloudy and wet with high humidity. Summers here are hot and dry, 60F+ at night and 85F+ during the day with low humidity (sometimes less than 10%). The climate here allows me to have 2 spaces one indoors for my Paphs and warmer growing plants and one outdoors for the cool tolerant plants. Sunlight here is intense and, depending on what you're growing, 50-70% shadecloth is used outdoors. 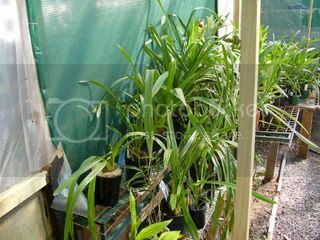 My outdoors growing space gets no direct sunlight yet is broght enough to bloom Cymbidiums, Australian native Dendrobiums and Dockrilla, and a few other things. The first picture is of this outside growing space. Outside I have to adjust my watering seasonally: in the summer at least twice a week (notice the trays under the Cymbidiums), in the winter about once a week sometimes less. The mounted orchids get soaked once a week in the summer with an almost daily misting to raise humidity, and get soaked about twice a month in winter with little misting. 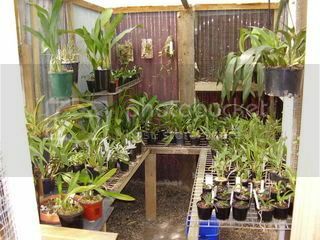 Indoors I grow mostly Paphs and Coelogyne with a few other things. The second pic shows how I grow in trays in a window. I rotate trays to give the plants on the lower trays a bit more light. In summer I water twice a week and in winter once a week. Light in the indoors is enough to bloom Cattleyas, Paphs, Coelogyne, and hopefully some Gongoras and Encyclias. I only fertilize the outdoor plants during spring and summer. Take a moment and post some pics of your growing spaces and let us know how you grow your plants in our space. Bolero, KenFL, R&P and 3 others like this. denite25 and Mjr like this. Well every one has probably seen my "work inprogress" with the renovation / construction of the GH, so I won't include those images. First image is my only Phal (Fanjan's Fireworks) which resides on a serving trolley next to the lounge room window which faces north, but gets indirect light due to the front porch overhang. I have a large beach shade outside originally put there to stop leaves getting into our frog pond, and which by luck happens to be 75% shade cloth, ideal for cyms. Under there I have 17 cyms, a zyg (Artur Elle X), a D. kingianum and an epidendrum which I am growing from a small kieki and it's starting to take on well. Nothing to be embarassed about at all. We all have different set-ups and the point is to gather a large pool of ideas and growing techniques. No competition. I remember admiring your humidity tray in another thread. It shows that a humidity tray can look like a real piece of furniture and havign a tray of orchids doesn't mean you have to destroy the look of a room. Can you imaging my metal shelves trashing the look of a Victorian parlor filled with oak woodwork? It looks like oyu have at least 2 Paphs there. What are they? 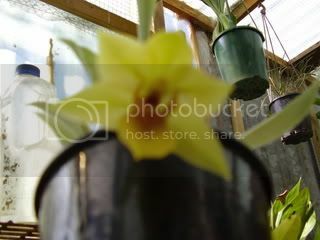 Thanks Anton, and your Cymbidiums get enough light to bloom under the tent? Check out my Web site and see for yourself. This was last year's crop. Ok, so I guess the answer to that question is a resounding "YES!" I especially like the light pink one. Very nice. That's Ann Miller 'Midnight' X Claude Pepper 'Tawny Port' and was grown by my father who died 23 years ago. Actually forgot to mention they do get morning and some afternoon sun, but anly for around half an hour of each. Last edited by Anton; 03-12-2007 at 04:38 AM. Ah yes, now I remember you mentioning those crosses previously in another thread. They're good crosses. Kevin, Awesome! I'd rather get locked up in your orchid room than at the Hershey Chocolate Factory which I thought, nothing could ever beat...until now! I see you've put fans on the shelves for the orchids. Living here in Fla., the summers are thick, hot, the air is still. I'm going to buy a few fans to keep the air circulating on them for the coming summer. Just beautiful Kevin. Dennis, I wish mine looked as pretty as yours. I just started my own collection for the first time a few weeks ago. I feel like a new mother. I keep going on to the patio, looking at them, positioning them, etc. I'm very excited as one that I purchased on the sale rack had a spike with another spike growing from the first one and now I've got 4 big buds. I'm soooooo excited about this. Anton, I went onto your sight and all I can say is, WOW. Your orchids are absolutely, positively gorgeous. What a great idea for a topic! Here is my 'setup'. I'm a newbie so don't have many plants... yet! I live in Colorado Springs, Colorado (elevation 7,000'). Our climate is very dry and our temperatures are unpredictable (this week we will have highs ranging from 40F one day to 70F the next). Night time temps are generally in the 20s and 30s. Summers here can be intensely hot, then again I've seen it snow in June. Thankfully, I have a new townhouse with a great atrium. All my orchids are indoors. The atrium is 10' x 22' (north/south) with no windows. The ceiling is 10' high with 3 3'x6' skylights evenly spaced. Due to the angle of the sun the north end is the brighter light, the south end gets only indirect light. Temp ranges are ~63F at night and ~75F day. I mist every morning, use humidity trays on all plants and have a fountain and humidifer on the south end. One more note, the south end contained a flower bed when I moved in, so I'm able to soak the soil (under the rocks) for added moisture. I've been in this house for 6 months and so far so good. The white phal (north wall picture) bloomed (Jan 20th) for the first time in 3 years. nursegordon and Srivida73 like this. Sandra, I'm glad you like my set-up, thanks. And yes I find the fans are essential. Good air circulation is essential for the prevention of all kinds of rot and fungus and to provide a fresh atmosphere. Here in Melbourne our summers can be 40C+ (105F+) and the fans also serve to cool the plants off a little. I actually should have more fans than what I do, I really should have fans on the smaller shelf on the right or perhaps a large oscilating fan for the whole area. Vivienne, Thanks for posting the pictures. It's great to see how people incorporate their orchid growing right into their living spaces. 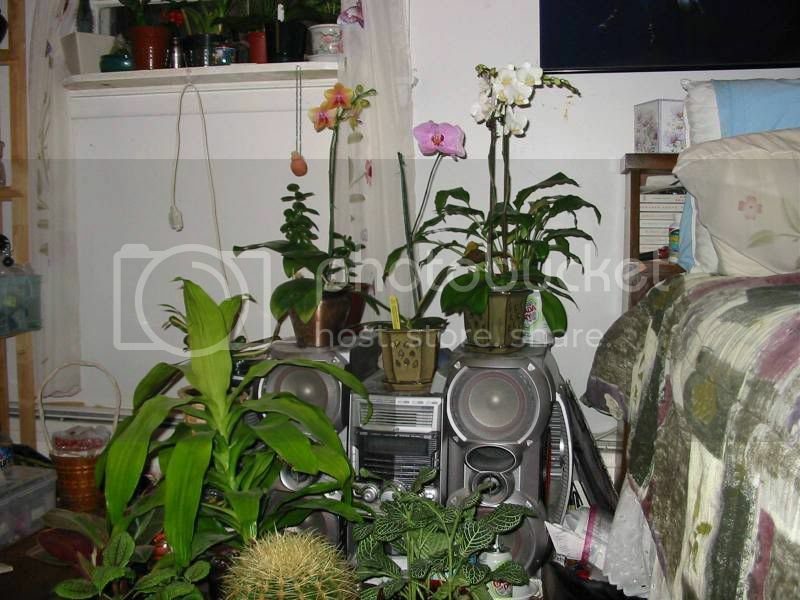 It's good evidence for how many orchids can be grown in the home without special conditions. 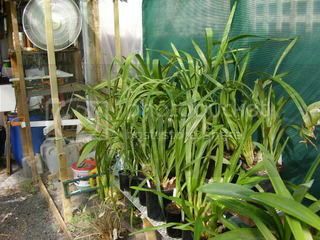 The "bright indirect sunlight" part of the room will be nice for all sorts of orchids that don't like the more harsh direct sunlight. Vivienne, I bet you play them nice music as well. Just to follow on, if you want tips on getting good photographs, I am a professional photographer, plus there are a few keen amateur photographers as well. With our help, maybe we can help Forumites to get high quality images to show our babies off in their best light on the Forum. Most of my pictures are taken on my point n shoot Olympus digital camera, so you don't need top end stuff to get good images. If you need help you can contact me at anton.drew@internode.on.net. NOW GET TO IT OR ELSE I'LL MAKE YOUR LEAVES WILT ! Last edited by Anton; 03-13-2007 at 10:23 PM. Reason: Darn typing dyslexia. Ok, ok! Mine will just have to wait awhile longer though. My 18-yr old daughter moved out a couple weeks ago. Hubby and I finished cleaning up the room a few days ago...just moved the rest of my babies in the room this evening. However, I still have to set up a few more things before I take a pic of my new growing space. Oh Alene, excuses, excuses, excuses. Dennis, I just received a digital camera that I don't know how to use just yet. I finally got it out of the box last evening after I saw this thread. I'll be posting my photos as soon as I learn how to work the camera! With all of you incredible growers who have been so forthcoming with information on orchid care to a novice like me, I just know I'm in the right place and on the right track. I'm grateful. Thank you all. I'll be posting photos as soon as I'm able to. All I can say is that you guys in the Sates must run up huge power bills. Love that speckled Phal, Fabolusus. Thanks for posting pics of your growing space. It looks great. How long have you grown this way? I understand basement growing with lights is fairly common. It can be a very successful way of growing. One of my orchid friends won a Best in Show trophy wiht an orchid grown in the basement under lights. She hung clear plastic shower curtains around her growing area to raise humidity near the plants while avoiding dampness in the living area. Thanks again for posting. I hope people are finding this thread interesting and useful. Anton- It has been unusually warm this winter, so after months of nothing but leaves and roots my Yu Pin Pearl decided to put on a show! kmarch- I have one window in my loft, a 15x5 ft bay window that is completly obscured by the 20 floor high rise across the street! I've been growing in my basement for 2 years now, but I am eagerly awaiting the day when I have a yard to grow in. Do you remember what the orchid was that your friend won with? And WHAT a show too ! I bet you're proud of that one, I would be. Last edited by Anton; 03-14-2007 at 11:23 PM. Reason: grammer AGAIN! Hello all, it's been awhile since I've posted anything so let me try to get this pic thing right. I live in central Florida, Sebring to be exact, and it gets pretty hot here in the summer and can get down to the low 30's in the winter months. Some of these pics are pretty old but you'll get the idea. Most of the structures were made from carport canopies we got from Home Depot. We put an initial cover of 50% shade cloth and then put on the poly sheeting. Afterwards put another layer of shade cloth. We have fans going in each one of the structures. The sides are made to roll up and down like an awning type deal. We just recently ran 240v out to them so we could use electric for the heat. We were using those tank top propane heaters but started to notice problems with our plants if we ran them for more than a couple of days. Electric is much beter for us. I can only put five at a time so I'll post some more shortly. I hope the first ones came through, here are some of the others. Hi members just a quick note to thank you for shareing you orchid houses. As i find this thread very interesting and helpful. i grow in the window seat of the living room (east) and a couple plants stands (and assorted phone books) in the kitchen (west). one of these days i'll snag the digital and take some pics. Love the photos Janet, especially the one you're holding in your left hand, that shows them in a better light than the one in your right hand. Tilly, .....WOW CONGRATULATIOS ON SUCH A WELL THOUGHT OUT AND NEAT SET UP. I am going to show these to "She who must be obeyed" to show her that a large GH in the backyard can actually enhance the yard and not detract. You've got on a larger scale what I'm planning in my small "interim" GH. After seeing Tilly's set up, I am ashamed of mine. However, I am planning a small shade house - and I must admit that I was thinking of a small canvas carport - on these lines. I live in the tropics - North Queensland, Australia. My problem is to keep plants cool - not to warm them up. So everything is on the open verandah, with a bit of shade cloth for eastern protection. When it gets really hot, I rig some more shade cloth over the top. The verandah is roofed - so I can at least control the water. All our rain is in summer and people growing in shade houses have very little in bloom during the wet. I was thinking of erecting a small carport and leaving the canvas top off - just using it when it rains heavily. But... I rather like Anton's beach shade - but it probably would not give enough light. Please ignore the dates on the pics - have never learned to turn them off or get them right! The open ends face North / South. The sides are East / West, with the lowest side facing East. This enables the early morning sun to sneak under and bath the plants in direct light. During late morning to early afternoon, the sun shines through the end next to the water tank and again gives them about 3/4 to an hour of direct bright sunlight. So, although it is around 75% shade, the design gives enough latitute to grow quite sufficiently as you have probably seen on my Web Site. Fabulosus, the basement grown orchid my friend won Best of Show with was a Bulbophyllum echniolabium (sp?). She won it in ... I think it was 2000.
tillystuf, Very nice indeed! Thanks for sharing these images. It shows that you don't need an enormous space, that even moderate sized space can serve us well. What are you growing on the ground under the benches? Townsville, Thanks for posting your pics too. I too owuld like to have the space for a shade or greenhouse but it's just not possible now so I'll do what I can. How do you keep the humidity up on your porch? I'd imagine it is easy during summer? And naturally lower in winter? So maybe it's perfect as is? Here in Melbourne winters = cool and wet, summers = hot and super dry. Thanks everyone, keep the posts coming! You've given me some great ideas already! To all, thanks for the nice comments on the greenhouse. To those of you who are cramped for space in their outdoor areas, these structures can be cut down to fit almost anywhere. Just cut down the connecting poles to the lengths you want and then assemble. Kmarch, to answer your question, those are all cattleya. These were purchased from Borlins orchids when they were going out of buisness. We are getting them back into good shape as they were for the most part in pretty bad condition. Once we get them back to healthy plants we will add them to our inventory on ebay so others can have a chance to get some very old classic plants to add to their collections. Maybe as the skies are wide..."
All I can say Maddy, is that they must love the music you play. Four Seasons by Vivaldi ? Awesome display of growing spaces! Spectacular collection of orchids as well. (I do play music to the plants: can't give you any reference but I remember reading something about a controlled study of the effect of different music on the rate of growth and health of plants. Kmarch - summer between 60% and high nineties. Winter can be pretty dry - 20 to 50% perhaps. I recently saw an episode of the TV show Mythbusters in which they tested the myth that talking to plants or playing music for them makes them grow better. They erected 7 shadehouses in which they grew bush peas under identical conditions except for one difference, the soundtrack. One shadehouse was the control shadehouse in which the peas were grown in silence. In one house, classical music was played, in another death metal. Into 2 other houses soothing, comforting speaking was piped and into 2 others, the plants were berated and threatened. The results showed that the peas grown in silence did the worst. 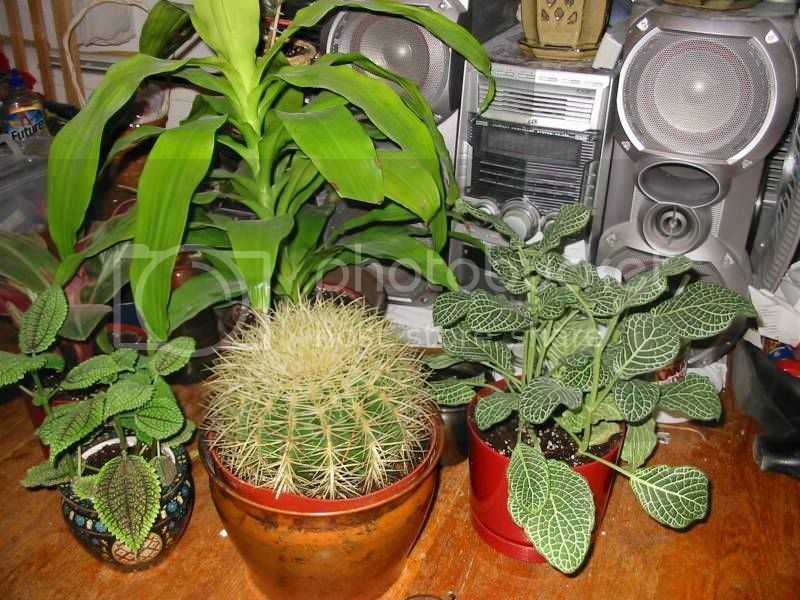 The plants grown with music did the best with the death metal plants doing better than the classical music plants. For the plants that were talked to, there was no difference in the plants being berated vs those being admired and encouraged. Since the sample size was so small they felt they could not confirm the accuracy of the myth but did agree it was plausable. Update on my finished orchid house. Just to top that off a pic of a Prom. Arlene: I'm still giggling. It only took you two weeks to redo the daughters room? I think I waited 10 days to make my "extra room" into a sewing & quest room. Of course, I did need to explain the difference to my kids between "guest" and "permanent house guest." Good for you, hope you have a beautiful orchid room! Gee, I like those figurines in the Large image Cynthia, .....so life like. Think you could have placed them a bit better, they seem a bit crowded all together. Does the fur smell musty when its wet for a while. ? Personally I would have ceramic figurines, less maitenance. Maybe I should get a cat. My dog likes pulling roots out. It took my husband and I two weeks because we had to wait until all of our daughter's stuff was moved out. We then dusted, vacuumed, and cleaned the carpet (had to wait for this to dry before moving the tables in). I should have pics of my orchid room posted sometime this week...been rather busy since we got back from Solvang/Santa Barbara. P.S. -- I truly like everyone's gh/sh set-up...better than mine, I think. Last edited by arleneg; 03-20-2007 at 08:13 PM. Reason: added P.S. Thank you all for your sharing - and thanks especially to Anton for advice. After seeing how diverse your setups are - and realising that our climate is (on the whole) pretty good for orchids - I have tossed the shadehouse idea. It was going to cost about $AU2,000 - plus I would not be able to look at my orchids all day as I can now. Instead I have bought 4 shoe racks, a portable wardrobe rack and some gutter guard. Next week I am going to install some lattice on the eastern wall of part of my roofed verandah. I will then be able to hang shade cloth whenever necessary. The southern end of the verandah is protected by a hibiscus which will grow as high as I allow - and fast. I attach photos of the new setup, without the lattice. I will paint the lattice either green or cream (to match the house). Any advice on which would be best? Thanks for posting this Townsville. I personally really like the idea of "living with" my orchids rather than having them stuck somewhere I'd never see them. I like the idea of having atriums, verandas, and other livign spaces filled with orchids. Nothing wrong with that setup Townsville, as I said in one of our private posts, whatever works for you is good. There is no good or bad setup providing they are getting the light they need, protection for the extreme elements, and protection for pests and diseases. look forward to seeing the completed setup. Cynthia, love your pets, they look amazing. Ah, yes, and the cats too! I am envious of your weather!! I did not know coconut palm will bear fruits at that size!. I have two coconut palms in pots indoors. They have only grown about 30cm ( a foot) in one year. I like the innovative movable shade that you have built for the plants. Thank you Pikevi . I recruited my husband to help me build the bench last month...it only cost us about $70.00 to build--compare to a few hundred if purchased.. The coconuts.. I think it depends on the species also, the one in the background started bearing fruits when it was only a little over 4 yrs old , but the one in the foreground took about 5-6 years . Very nice, prisana. My experience is that many of the orchids we grow LOVE the dappled sun/shade found under trees. It also allows for lots of nice fresh air. Nice bench/shelf units as well, especially the one with the awning. Did you make those yourself or buy them? Thank you kmarch..my hubby and I built that bench ourselves ( and we didn't even lose any fingers!! ) It's our first time building anything..I'm surprise it's still standing...we went looking for orchid bench ( well, I went.. and my husband was forced to go with ) and they were all over $200.00 so we just went to Home Depot and got the wood and other stuff for under $70.00 !! The labor ? was labor of love.. I live in a small apt. on a fifth floor with the benefit of having a south facing balcony. Nice weather, good humidity (almost never less than 50), and covered from strong winds. As you can see, i can basically keep smaller plants due to space. There is some space still for hanging and i'm still thinking on the best approach to shelves. Manuel, you're lucky to have the ideal growing conditions for orchids. It makes it easier for you to grow them. You have a very nice set up on your balcony. Thanks for sharing. 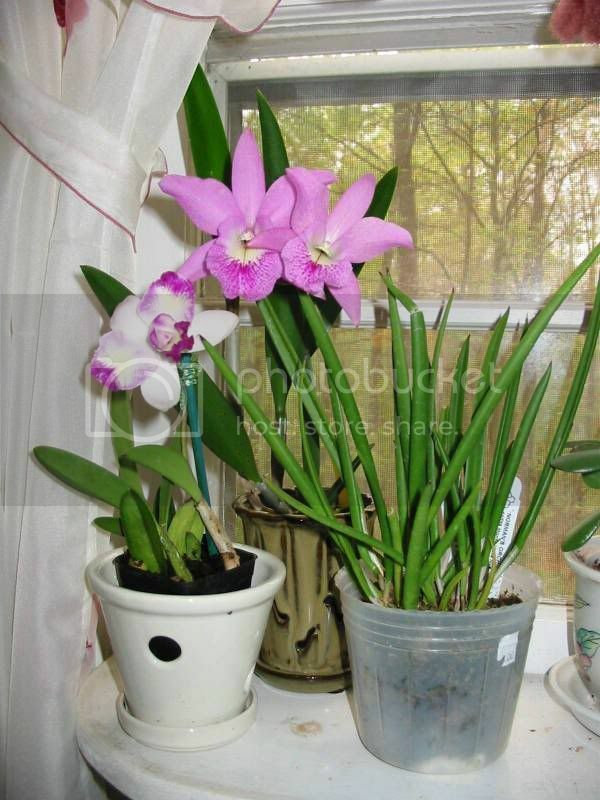 Yours is another great example of how to grow orchids in your living spaces. The baskets hanging on the wall look quite nice. Take a look at prisana's wood orchid shelves (pics posted above). They're attractive and practical. You'd have to redesign them to fit your space, and build them, but it is one possible solution. i live in a smallish loft in atlanta with a huge wall of windows. the windows are north west facing (mostly west, just north enough that the rest of my building blocks direct sun except from 2-3 pm, all the rest of the day i get bright indirect light) about 20 ft wide in the living room and 8-10 ft tall. we have temps ranging from 10-40f in the winter and 80-110f in the summer. it's just started getting warmer here, so now the dens (which are small and hidden behind the massive phiaus) are up on the window sill enjoying the sun. The white BoP can get massive can't it? I live in Melbourne Australia and recently saw one that must have been 15ft high and at least as wide. Are they all that big? I took these pics last weekend and finally got the time to prep them for posting. East south corner of my eldest daughter's bedroom, now my orchid room. North east corner of the orchid room. South west corner of the master bathroom. South window of the master bathroom. I'm still waiting for the humidity trays to arrive. They will go on the new shelves. When hubby gets home, we'll head out to pick up four more fluorescent lights and two more light brackets(?). When it's all set up, I'll take another pic and post it here. Last edited by arleneg; 03-27-2007 at 09:29 PM. Reason: added the correct link for pic 3. Wot ! No lillies in the bath? Well you certainly have plenty of space to occupy Arlene, looking good so far. Thanks for your post! it looks like you're making good use of your window space! I've often thought corner windows like that can be tricky to get the most out of. The light stand looks like it'll do well for you too. What kinds of plants are oyu planning to put on the light stand? Are those florescent light fixtures? A Note on Florescent Light Fixtures: I read an article about 7-8 years ago that showed, with all sorts of impressive graphs and charts, that using one cool florescent bulb and one warm bulb in a two-bulb fixture gives almost the exact same spectrum of light as does the more expensive grow-light bulbs. The entire time I grew with florescent lights, I used this method, one cool bulb and one warm bulb. 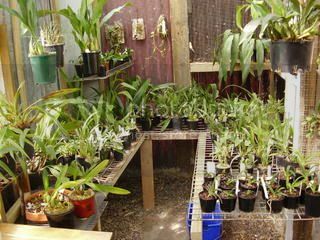 With this method I was successfully able to grow and bloom, Coelogyne (finbriata, ovalia, nitida, gramanifolia), Paphs (all sorts of hybrids), Phrags (even besseae), Dendrobium (moniliforme), Bulbophyllum, Haraella retrocalla, Leptotes bicolor, and a few other things. The cost savings is substantial, one cool and one warm bulb costs less than half what 2 grow-lights cost. Where can I buy inexpensive florescent fixtures here in Australia? I have seen 2-bulb fixtures, but they are nicer ones like for a kitchen and around $50 for one 2-bulb fixture (!!!). I'd like just cheap shop lights. Kevin, here in Adelaide, we have a plethora of cheap light shops. They make their own fittings as well. I'll see what prices they are for you. The first set of florescent lights installed are plant lights. However, this evening, I bought lights that have the warm/cool spectrum and will just add those to the existing ones I have. I hope they will help my orchids grow. If they do give enough light, I will then purchase the same warm/cool lights, much cheaper than the plant lights! Oh...I plan on placing some Phals and other low-medium light orchids on the bottom shelf and med-high light orchids on the top shelf. If I run out of space on my growing tables, I'll just have to replace them with the same shelf set-up. Last edited by arleneg; 03-28-2007 at 01:26 AM. Reason: added last paragraph. How does your daughter feel about the room? I bet the room looks nicer now!. Great looking plants. I'm sure it feels great to have all that new extra space to indulge yourself! Outside of my west windowsill area, the rest of my plants are currently in the south window. I'm just waiting for warmer weather to get them on the patio, however, that will be a short growing season (maybe June-October). That's why I'm inquiring about your shelving unit. You're making great progress. I'm amazed at all the wonderful ideas contributed for growing spaces. Seems if one wants to grow orchids, one will find a place to grow them. Keep us updated. mine's still a baby. they take over people's yards in florida, i've heard of them getting 30-45ft outside. i'm hoping for 10-15 feet so it'll fill in some of the vertical space in my loft and make the ceiling look less oppressively tall. i actually watched a "dirty jobs" episode where they had to cut down a clump of white BoP that was over 8 ft in diameter. insane. Anton -- I might add some lillies in the bath next time. prisana -- A couple of my orchids did get some white fuzzy stuff. I immediately treated them with hydrogen peroxide and haven't come back. Plus, I did some leaching of the potting mix. Otherwise, during winter, I put a portable heater in the master bathroom to warm up during early morning showers and sometimes in the evening. During spring and fall, I have the window open for fresh air. Summer time, the window is usually left closed during the day due to the 90F-100F temps we get and have the a/c on. But I open it up in the evening and have a fan blowing all night long. With all that, I guess it keeps the white fuzzy stuff away. mdomingz -- She visited twice and didn't say anything after seeing her old room (which is much cleaner and clutter-free now! ). Sharyn -- The shelving unit I have is a storage/work type shelving. And, yes, the shelves are adjustable, and you can have two shorter units instead of one tall one, if you like! The unit comes with wheels. I decided not to have them on since the floor has carpeting. I bought the unit from Costco (similar to Sam's Club, I think), a warehouse type store where you can buy in bulk. In case you can't find one in your area, here's the link to the product page. Thanks all. I can hardly wait for my humidity trays to arrive, so I can finally set up my plants on the shelves.